You can see it from far away of course, but its only once you stand right at the top, right at the edge of the falls that you realise how high it really is. Seven hundred and forty one feet if I remember correctly, and supposedly the highest single drop waterfall in the world. I was certainly in no place to argue. 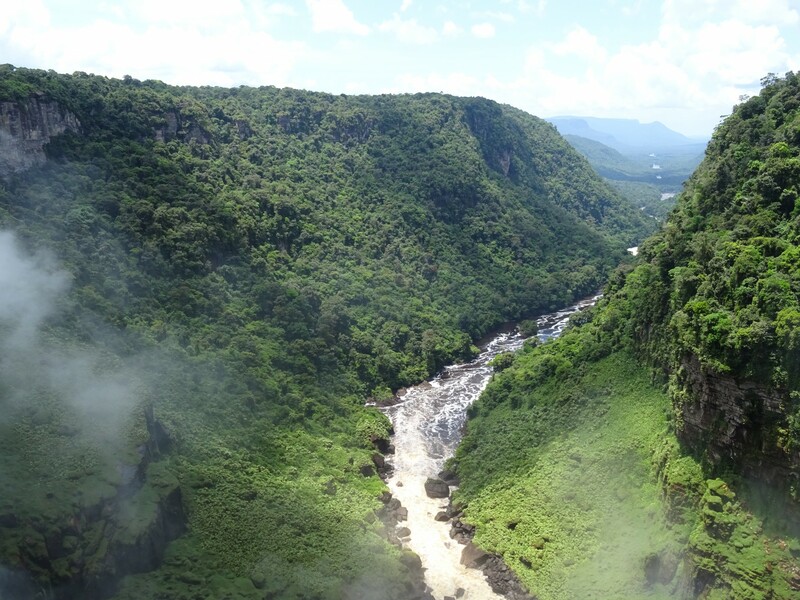 It’s absolutely stunning, and if you don’t want to look over the falls the view down the valley, created by the Potaro river, is just as incredible. Awesome is all I can say. There’s a waterfall in the background too. As we were in perhaps a less safety stringent country than the UK, leaning over the edge is definitely permitted, though perhaps not recommended. Apparently one girl had thrown herself off the edge a few years back, after claiming she was going back to pick something up. I was glad none of my group did anything similar. The valley beyond Kaieteur. Nothing for hundreds of miles around, and absolutely stunning. Getting to the falls required a mini adventure in itself, even if done the easy way as I, naturally, did. Upon arriving at the airport, dutifully early for my nine o’clock check in, I was shuffled off to the VIP lounge, away from the rest of the apparent plebians. I wasn’t sure what I’d done to deserve it, but there was coffee available so there were no complaints. Originally no passengers seemed to arrive and I wondered if they had mistaken me for some handsome celebrity. I probably would have forgiven them, but eventually, only about 30 minutes after final check in, my comrades arrived. All four of them. Who wouldn’t want to fly in a plane like this? That’s right. It was a six seater aeroplane, and essentially a toy. Not one to be nervous about such things, I gleefully clambered in, only pausing in an attempt to get my legs in. Once up in the air we were treated to amazing panoramic views of Georgetown, the rainforest and later, the Pakairama mountains. On the way I got to know the other passengers better (when I could hear them), especially Joe, who was visiting from Canada where he and his wife had emigrated from Guyana to. He was a font of knowledge regarding all aspects of the trip and had never been to the falls while he lived in Guyana, but had obviously been lured back in an attempt to see some of Guyana’s riches. In amongst the Pakairama mountains. You don’t get too much more isolated. After Kaieteur, the plane took us further. Out on the Brazilian and Venezuelan borders, the scenery changes dramatically as the rainforest makes way for dry, hilly plains where the sun bakes down relentlessly. This is the locale of Orinduik Falls which was totally different, consisting of many small waterfalls each allowing the waiter to cascade down to the next. This created small pools that you could bathe in and definitely the best shower I’ve had in a long time. I no longer look this clean. The next day, it was time to set off again. 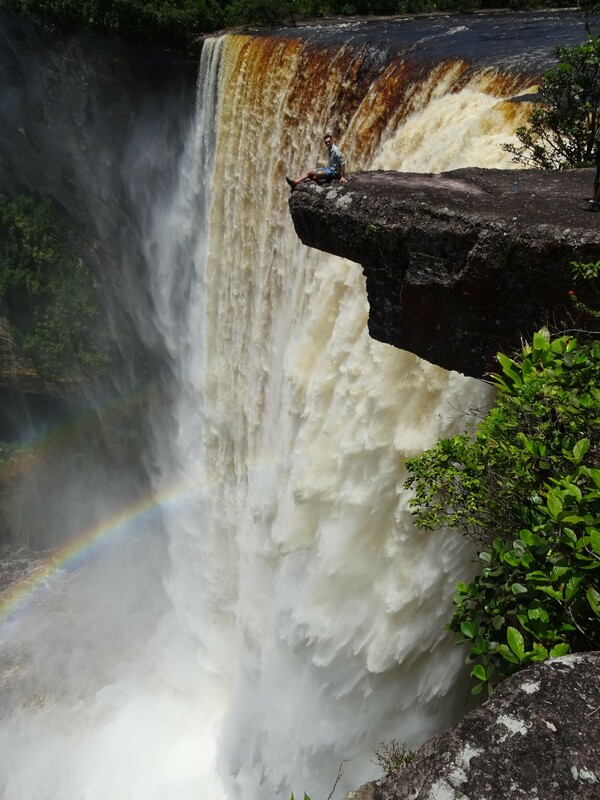 When arriving in Guyana, it had seemed like such a shame to not see some of the interior locations so renowned as Guyana’s biggest attractions, despite the expense. After considerable planning though, and many emails, I had done it. I would be staying at the Oasis lodge, in the northern area of Guyana’s Rupunini savannah. 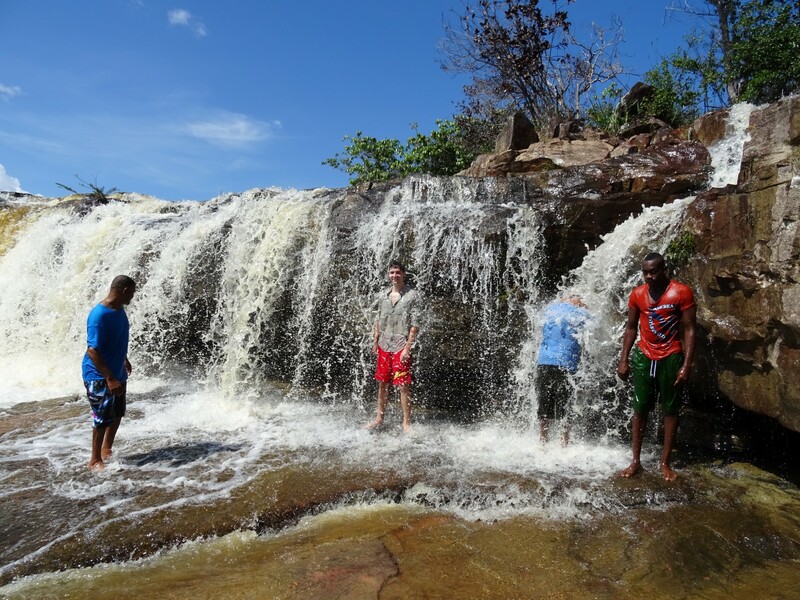 Located just off Guyana’s main road through the country, it should be easy to get to. I can assure you though, its not. 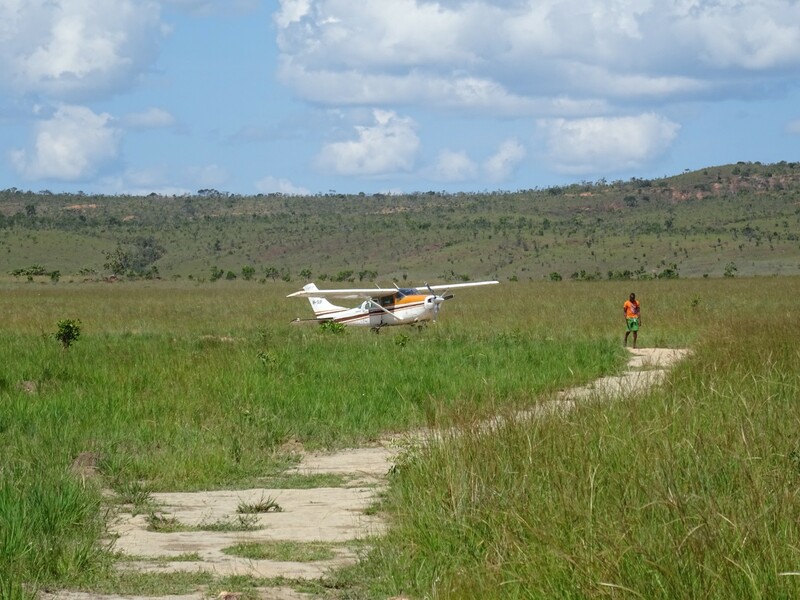 This story involves a minibus, a wooden barge and 450 kilometres of unpaved, dirt road. As I sat down, outside the minibus stand, I looked cool. Not because I’d been sat in the Oasis café beforehand, with its convenient WiFi and godsend of an air conditioning system, but because I had my cool face on. It was one of those occasions, I’m sure you know the kind, where it’s necessary, it’s required that you don’t look scared. For good reason. I had arrived dutifully early for my 5 o’clock requirement, and once my bag had been placed on a table safely out of my reach, I wanted. Conveniently situated adjoining a second hand gold and jewellery store on a nothing less than seedy looking street, the spot seemed to attract a variety of mysterious looking clientele. While several of these seemed to serve merely as amusement for those chauffeuring large wads of money between the buildings, others seemed more intrinsically involved in the machinations. Most notable was a small Indo-Guyanese man who had obviously deemed it appropriate to wear a string of condoms draped over the front collar of his shirt. A classy look if I ever saw one. 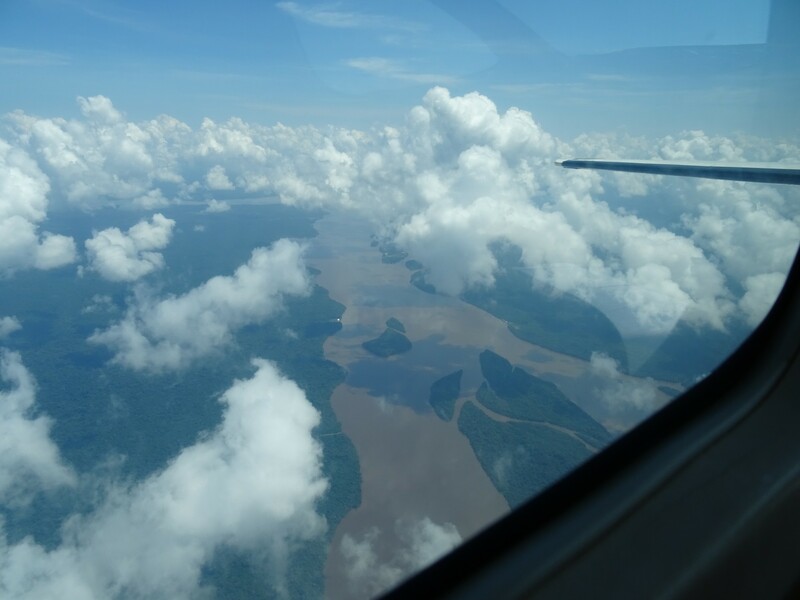 The Essequibo from the air. Pretty small as rivers go. Throughout this though, alongside the random jibber and weird looks that floated in my direction, my bravery sat unadultered. That was, until one event occurred that I could not have been prepared for. After an unusually smart looking car pulled up outside the jewellery shop, and several minutes of seriously heated discussion, one of the men went back inside and store back out carrying what could only be described by a novice like me as a massive AK-47. I’m pretty sure I’ve played enough games in my lifetime to recognise one when I see one. About ten feet from my face, he carried it one handed, happy as Larry, and placed in the car. This was before proceeding back inside, leaving car unlocked and gun unattended for about fifteen minutes before finally driving off with it. As events go, considering the sparsity of guns that exist in my area of the UK, it was pretty surreal. Defying all normal logic however, this actually increased my confidence in the journey. One would assume if they have that sort of weaponry for the company’s dealings that taking my possessions and money would be the least of their worries. 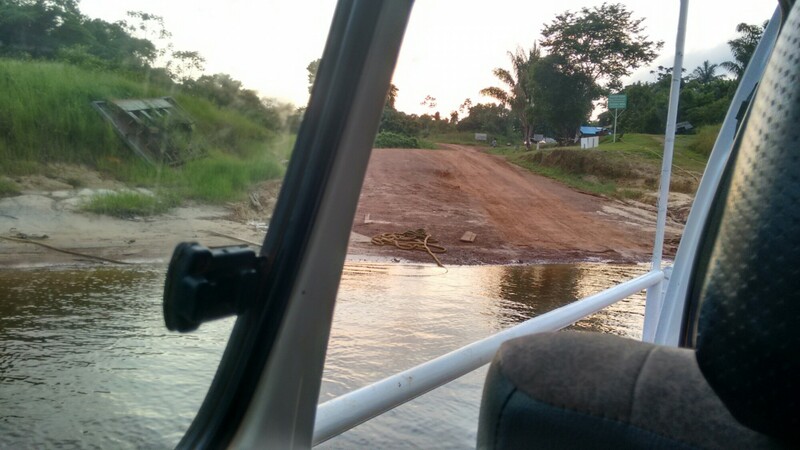 The Kurupukari river crossing. I was too tired to take good pictures. Finally, at about 6.30, we set off. After an uneventful first stretch to Linden with the paved road, the tarmac ended abruptly, catapulting us into a world known only by top rally drivers. Despite the change in conditions, our driver continued racing at top speed, wending his way around the large craters and pits in the road. Bigger bumps were inevitable, throwing us one way and then the next in the tiny minibus. Red dust blew all around as the rainforest bounced by. Through it though, I grinned. It was exhilarating, and though I probably should have been scared or thinking of the danger, I wasn’t. Of course, after a few hours have passed by, the sensation of hitting your head on the ceiling every few seconds starts to get old, so by the time we reached the Kurupukari crossing at about 3AM, everybody was wiped, quickly falling asleep in swaying hammocks in the middle of the jungle. I was still half asleep as our minivan crossed the Essequibo river on the wooden barge at sunrise. 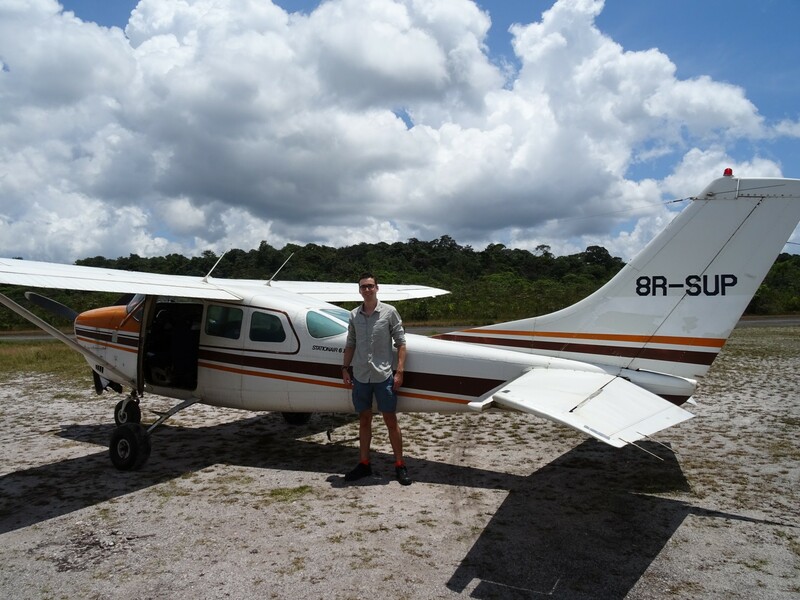 Aeroplane, August 2015, Bus Travel, Isolated Places, Rainforest, Savannah, Scared to Death, Spectacular Views, Waterfalls. Bookmark. AK-47s huh? I don’t think we’ve seen anything that exciting on our adventure yet  Safe travels and I look forward to following the blog. I’m not sure I’d be too jealous :P. Cheers :D.